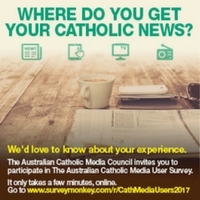 Time is running out for you to take part in the first ever Australian Catholic Media User Survey. The Australian Catholic Media Council, under the auspices of the Bishops Commission for Evangelisation, is looking to hear about where and how Australians find their news of the Church in a new survey, which launched in late September and must close by November 30. Australia is blessed to have a strong and vibrant Catholic media ministry and the Australian Catholic Media User Survey hopes to capture a snapshot of how people use Catholic media and what it means to them. “If you regularly or semi-regularly consume Catholic media, whether that be traditional newspapers, magazines or web-based publications and social media platforms, then the Australian Catholic Media Council wants to hear from you,” said Council chair Debra Vermeer. “Do you find that it helps to educate, form, challenge and deepen your faith, connect you to the local Church or to the universal Church? What is the particular character and role of Catholic media in Australia in 2017 and what might you hope it will be in the future? How can we strengthen Catholic media in Australia? The results of the survey will be used to provide advice to the Bishops on the Catholic media landscape now and in the future. This entry was posted in Uncategorized on November 15, 2017 by ACBC Communications.